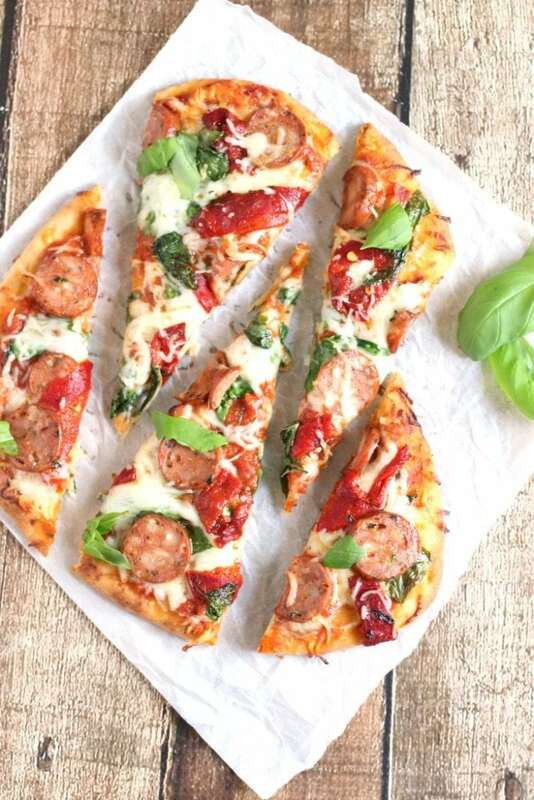 This Sausage and Peppers Flatbread Recipe is a sponsored conversation written by me on behalf of Aidells®. The opinions and text are all mine. One of my husband’s favorite meals is sausage and peppers. The night my grandfather taught him that most Italian restaurants have it available even if it’s not on the menu might have been the happiest night of his life. Well, maybe second to the birth of our kids. And hopefully our wedding night. But you know what I mean. He was really, really, really excited. For good reason! 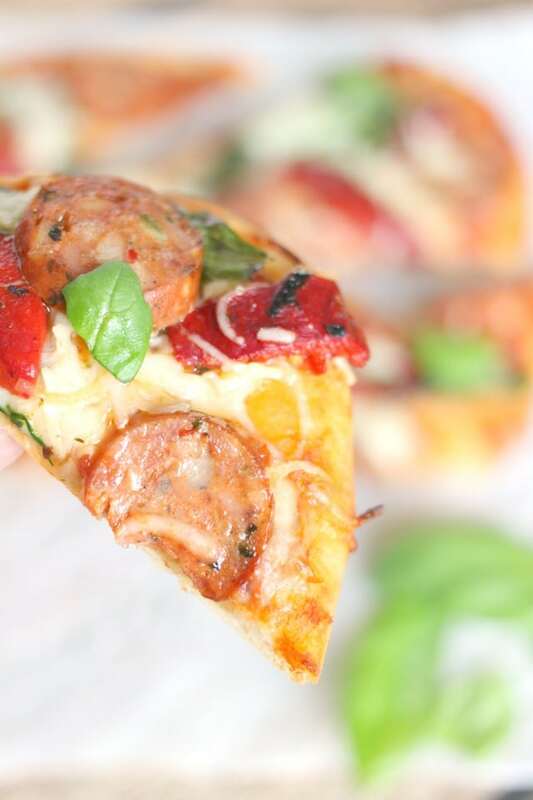 Sausage and peppers is one of those delightful combinations that is hard to beat. Wesley has been having trouble sleeping lately and as a result was a little grumpy this past week. So, I wanted to cheer him up with a twist on his favorite Italian dish! 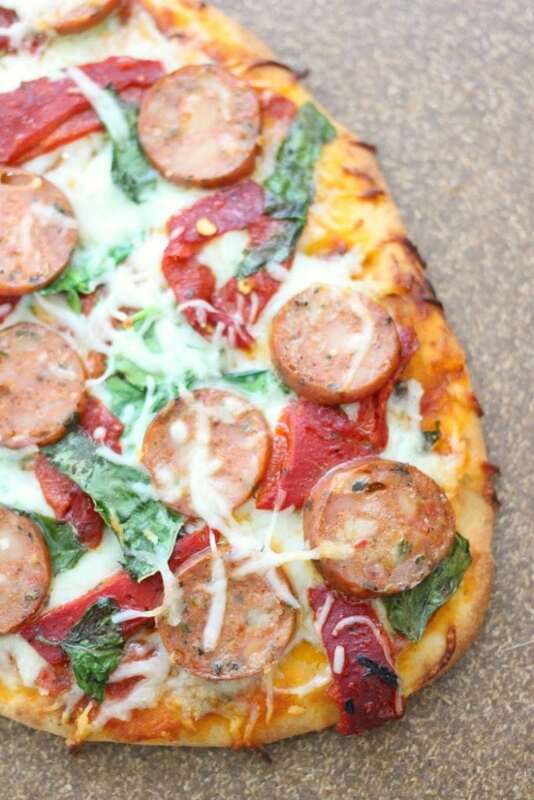 This Sausage and Peppers Flatbread took a total of 20 minutes to make (including bake time!) and turned out delicious. P.S. Scroll down to see my first video! I’m so excited about it – please tell me what you think!!! Pretend the bowl of red peppers is full. Oops, I may have been snacking as I worked! 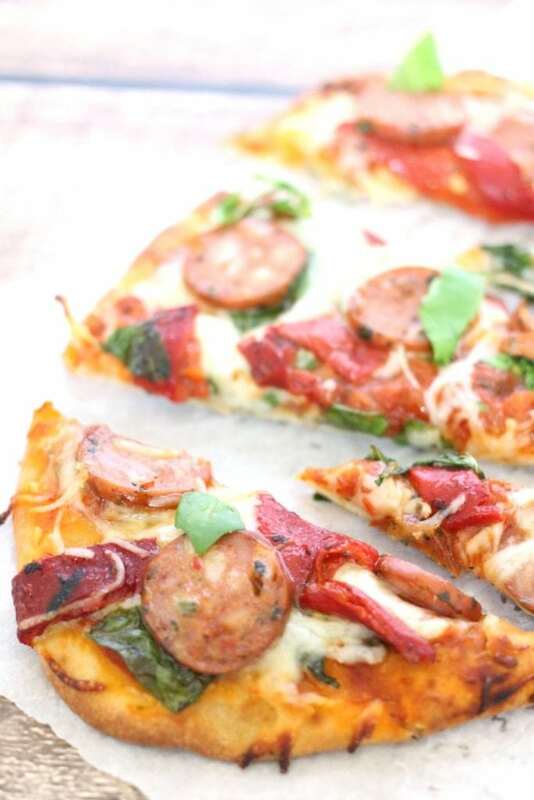 You can use any combination of ingredients (so long as you don’t forget the peppers and sausage, of course!) 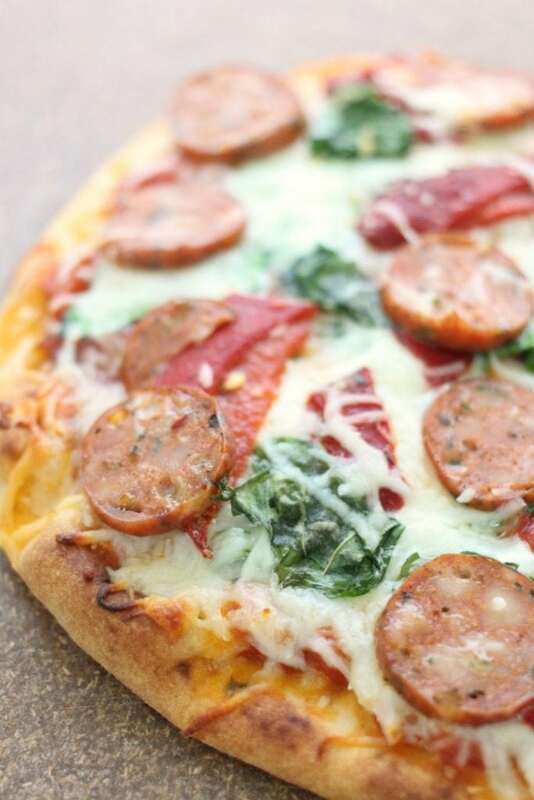 – I chose to include marinara, mozzarella cheese, Italian sausage, fresh spinach, fresh basil, and roasted red peppers. 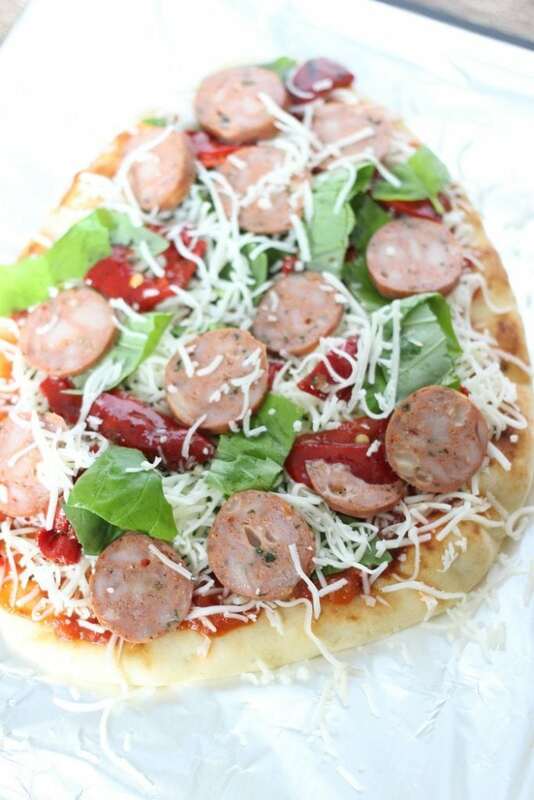 Parmesan cheese, roasted garlic, and red pepper flakes would’ve also made great additions! I picked up this Aidells® Italian Style Smoked Chicken Sausage from Publix. It was delicious! 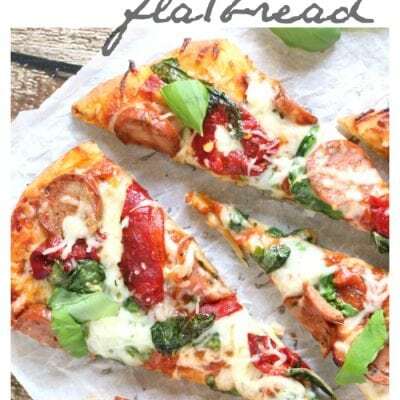 You could go all out and make flatbread from scratch (here’s my favorite dough recipe) and roast the peppers yourself, but we put this together as a quickie lunch break meal and utilized pre-made flatbread from the deli and roasted red peppers packed in olive oil. I added a touch of freshness with the baby spinach and basil leaves. 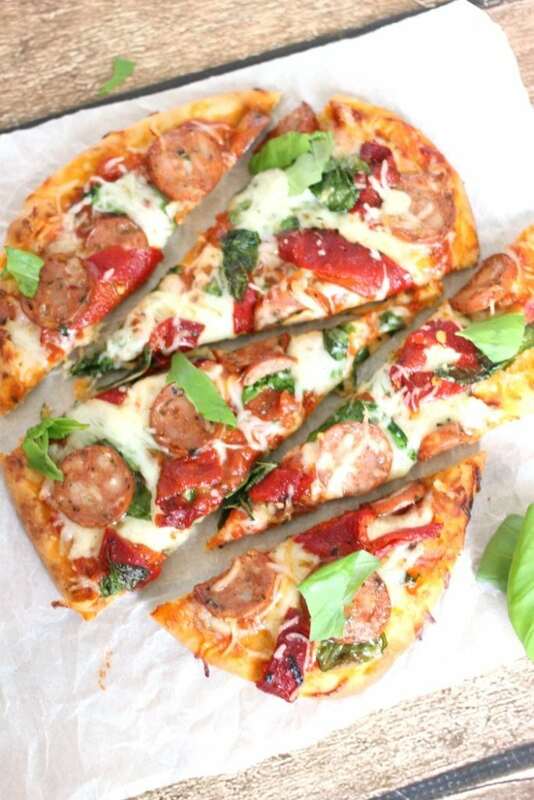 Pile ingredients onto flatbread in the order they appear. 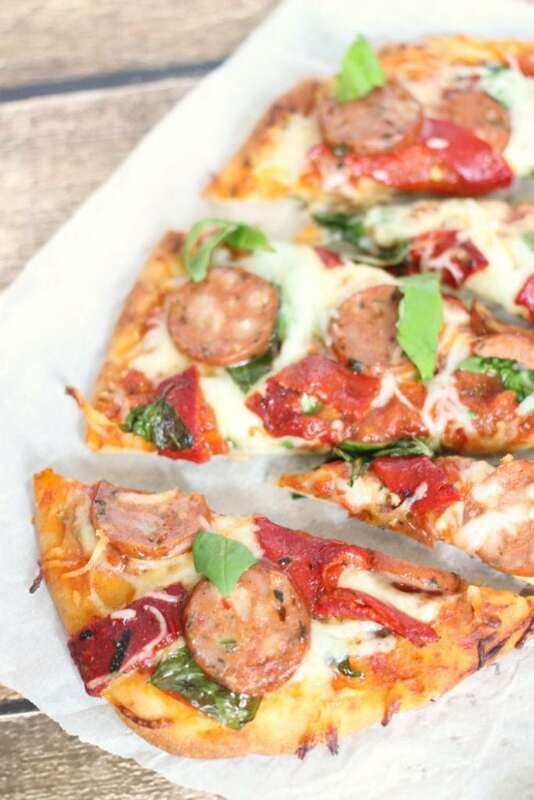 Place on a cookie sheet and bake on the center oven rack at 425 degrees for 15 minutes, until crust is turning golden brown and cheese is melted and bubbly. 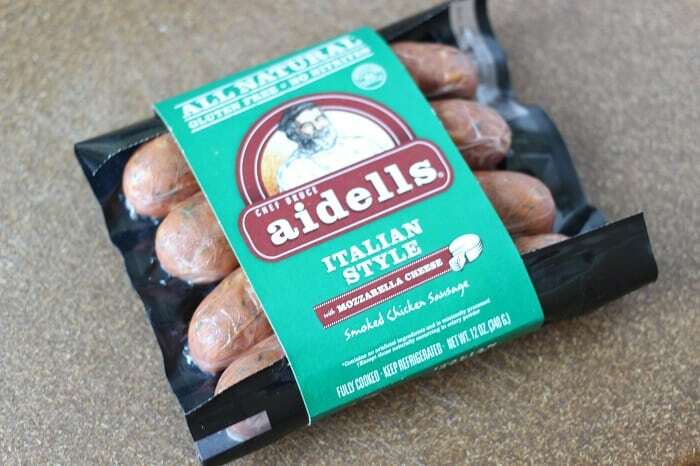 We’ve loved Aidells® sausage in our home for years. 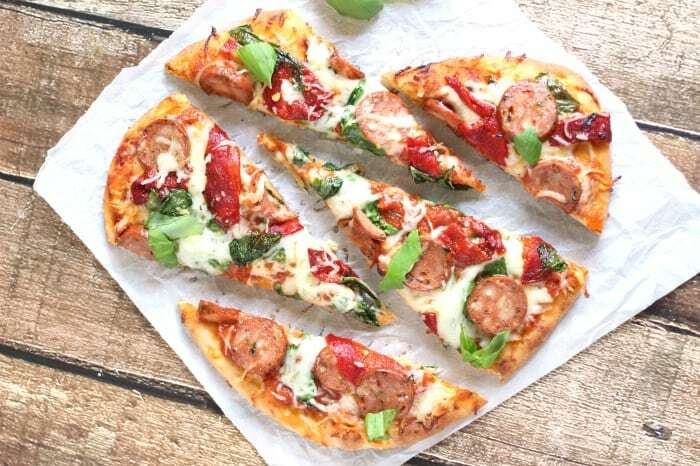 Not only is it delicious (the Chicken and Apple dinner sausages are my personal favorite), but they’re also gluten-free, contain no nitrites, and no added hormones. All of Aidells® sausages are hand-crafted with real, hand-picked ingredients in small batches. And *huge* bonus, they’re fully cooked and ready to eat in just 8-10 minutes. I get mine at Publix and this week there’s an in-store promotion of 2 for $10 from 3/17 – 3/25! 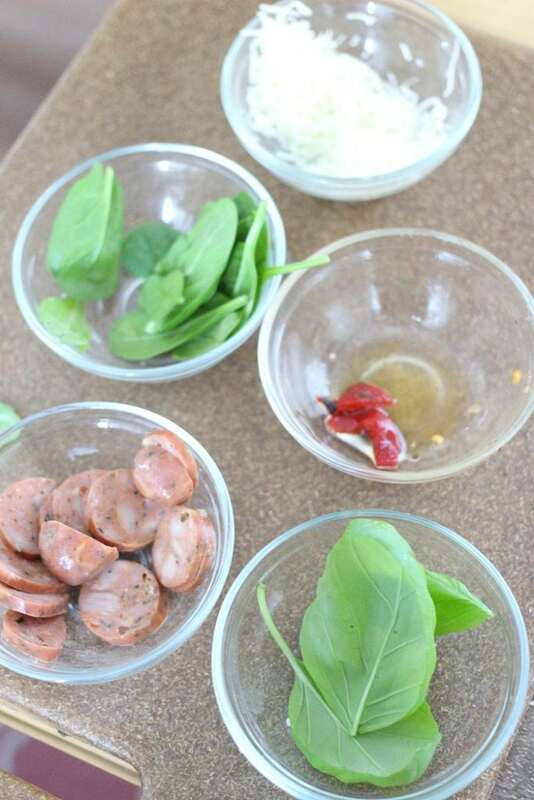 The sausages are available in these yummy flavor combinations: Cajun Style Andouille, Chicken & Apple (also available in minis), Italian Style (featured in this recipe), Pineapple Bacon (also available in minis), Spicy Mango & Jalapeno, Roasted Garlic & Gruyere Cheese Smoked Sausage, Organic Spinach & Feta, and Organic Chicken & Apple. 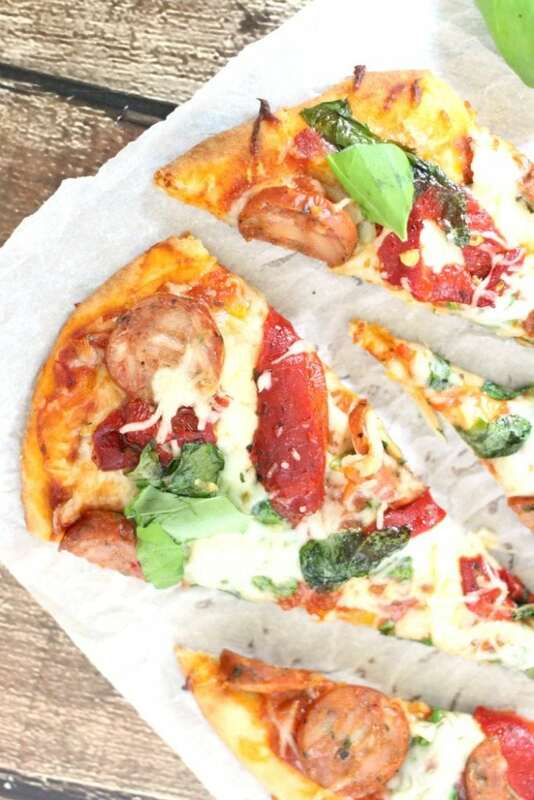 « 57 GREEN RECIPES for Your Holiday Party! I made it yesterday and my daughter really liked it. Thanks.